Technology has powered the human race to unimaginable possibilities and it is slowly taking every aspect of the human life right from the first year of life to adulthood. 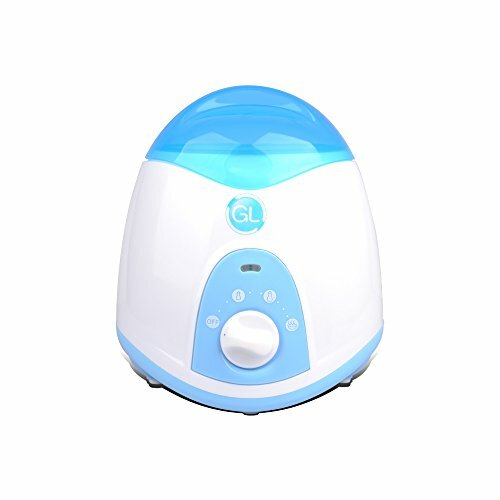 Our little ones deserve a share of these new possibilities, and the technological world has responded by creating a technological blessing that has simplified the life of many mothers in the world today, the bottle warmer. The bottle warmer has helped to solve the shortfalls that come with traditional methods of heating and has received a lot of support worldwide. Every technological breakthrough is usually followed by a myriad of models and brands that leave people scratching their heads trying to figure out the best option for their needs. This review is dedicated towards empowering you with the necessary information to make the best choice for both you and the little one. Before we plunge into models and brands, let us have a moment to explore some of the commonest questions posed by curious parents about bottle warmers. DO WE REALLY NEED THE BOTTLE WARMER? On an honest note, best bottle warmers are a recent innovation. There were times when these technologies were non-existent and people had babies and still managed to keep them healthy anyway. This is not to say you should throw away the idea of having a bottle warmer. 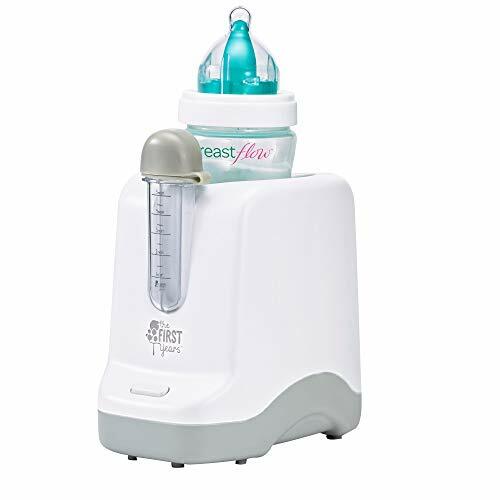 The key factor that makes some mothers to think of the bottle warmer as a necessity while others go for the more traditional route, is the baby’s reaction to temperature differences. Some little ones tend to be more specific in terms of the temperature associated with the bottle so much so that the preparation process needs to take extra care and be more precise. It all comes down to your experience as a parent. If there is an indication that you may need to be more specific then it’s certainly logical to go for one. HOW DO YOU USE THE BOTTLE WARMER TO HEAT THE CONTENTS? There are a myriad models of bottle warmers, each with a particular way of heating and a set of instructions. 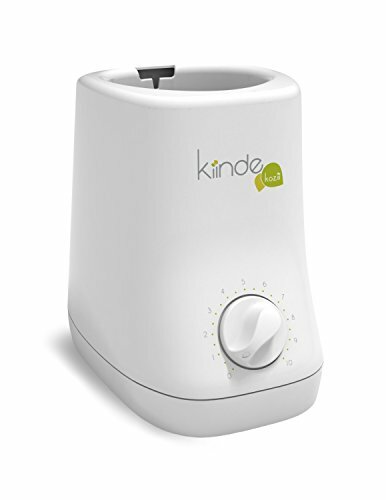 Some bottle warmers use steam for heat, some use water baths and other combine the two modes of heating. Additionally, the bottle warmers tend to differ in terms of capabilities where some utilize advanced technologies while others employ a simpler approach to heating, leading to differences in the way they are used to heat the contents of the bottle. In short, it all depends on the brand and the model. A universal approach to all warmers doesn’t really exist. HOW LONG DOES IT TAKE TO WARM A BOTTLE? Different brands have different capabilities and one of them is the amount of time it takes to achieve appropriate heating. In other words, different bottle warmers take different amounts of time to heat the contents of the bottle and this depends on the underlying mechanism of heating. For instance, bottle warmers which utilize steam heat faster than those which use water baths as a means of dispersing heat. When it comes to baby feeding products, Kiinde is one company that has received critics acclaim due to the high quality products they produce. The company took off as a product of the passion and creativity of Michigan Institute of Technology’s students and lecturers. It was basically a movement which was dedicated to improving the lives of parents and their little ones through innovations that make baby feeding easier while not sacrificing the safety and health of their little ones. The Kiinde Kozii Bottle warmer is one of the products that have put the company on the spotlight. When compared with top-end bottle warmers, it generally seems that the product is highly regarded by most parents. Let us take off and review this product and see if it’s worth the attention it receives. The Kiinde Kozii comes in form of a compact sleek bodied white chamber that is without doubt pleasing to any critical eye. The color and the sleek design leaves the impression that the designers had the values of hygiene in mind and applied them with great caution. The bottle warmer is roughly 1.5 pounds in terms of weight and a dimensional combination of 8 x 8 x 6 inches. Let us consider the crowning functional features of this product. Heating method: The bottle warmer uses what is known as the water bath. In principle, it uses convection technology which basically involves the process of circulating heated water around the bottle where the heat is transferred from the outside to the inside of the bottle. In this case the bottle warmer has a reservoir that transfers water into the water chamber that holds the bottle. Subsequent heating causes the water to rise up while heating the baby bottle evenly. Auto shut off mechanism: The bottle warmer incorporates an automatic shut off mechanism in its system which works in sync with the timer. Once the required heating time is accomplished, the shut off mechanism is activated while the water is directed back to the reservoir. Average warming time: The bottle warmer takes about 6 minutes to complete the process. Patent pending safe heat technology: The bottle warmer has been tried and tested and it is clear that it is designed in such a way that it heats up the contents of the bottle, that is breast milk and formula, without compromising the quality. It incorporates a notification feature which involves a click when the process is completed. It has an impressive reservoir volume as it is capable of holding adequate water for as much as ten cycles. It is capable of heating bottles in a successive manner without cooldown breaks. It has an excellent heating method that keeps the much needed nutrients safe. The auto shut off mechanism eliminates the need for constant monitoring. It has a smartly designed water system that adjusts the water level automatically. You are assured of safety through the recognition of the product by the Center for Disease control and the United States Department of Agriculture. The notification sound at the end of the heating process is not as loud so you may have to be close. The price tag is on the higher end when compared with most bottle warmers. This bottle warmer is without doubt an elite product when it comes to the world of feeding products. The overall design and feature set is impeccable thus substantiating the high regard it receives from both authoritative entities like the CDC and customers in general. Based on 1392 customer reviews on Amazon, it enjoys a 3.2 stars out of 5 stars rating which is great considering the larger sample that was used. 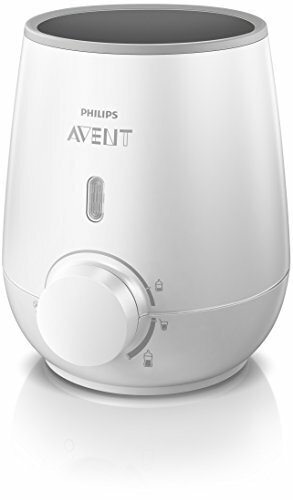 The Philips AVENT best bottle warmers proves to be one of the most popular bottle warmers owing to the craftsmanship in design and a superior feature set. When it comes to the involved dollars, it seems the bottle warmer presents an option that won’t blow most baby inventory budgets. Let us move forward and see if there is any truth in this. The philipsAVENT design comes in a typical philips body that oozes with class and style. The usually white colored egg shaped body is sleek and can be a very pleasing addition to your beautiful modern home, especially the kitchen. In terms of size and weight, it comes with a length, width and height combination of 7.5×7.1×6.5 inches. The weight shows a 1.55 pound value thus promising no issues to do with space and portability. If you are in for a simplistic design that offers great performance, then this may be a good option to consider. It may lack some other additional smart features that other bottle warmers boast of but it offers great value for the associated price tag. Based on 884 customer reviews of the product on amazon, it seems to be doing well with a 3.8 star rating out of 5 stars. This positivity from the actual users tells the whole story about the products success. 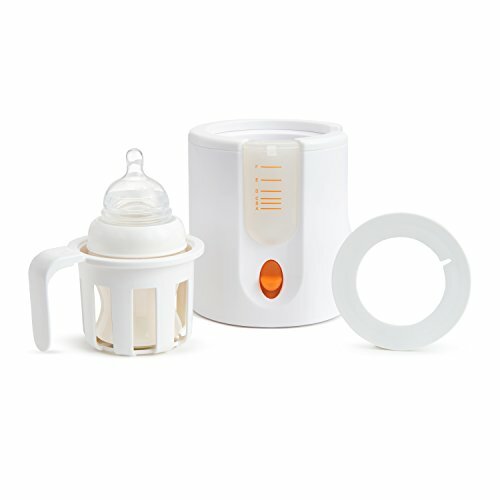 Next up on our list is the Baby Brazzer safe and smart bottle warmer. It is without doubt one of the most feature packed bottle warmers on the market today. The high tech features incorporated in this product are quite impressive, and it proves a good fit for the progressive parent who cares a lot about new technological trends and how they relate to the little ones care. Let’s put this gadget under the magnifying glass and see if it’s really worth the 84 dollar Amazon price tag. Right from the moment you take it out of the box, you will be met with an air design ingenuity. It doesn’t take the usual design as witnessed in most bottle warmers but rather embraces a unique two sectioned build. From outside, you see two main sections consisting of a silver body with a digital control panel at the base and a glass steaming section on top. The two sections form a beautiful gadget that should be a delight to add to any homes collection. In terms of size and weight, the gadget has a combination of 21x15x7.5 inches in length, width and height. The associated weight is 4.55 pounds. From this you will see that it is relatively bigger and heavier than most of the bottle warmers we have considered so far. Let us cross over to the key features associated with the product. It has a mammoth size when compared to other bottle warmers. It has a high end price tag. The water has to be measured with each and every use. This gadget is definitely elite when it comes to features and performance. If you are a tech savvy person and are in need of something that has a little more than the average bottle warmer, this may be a strong contender on your option list. When it comes to the actual user’s experience, amazon reveals it has done well so far. A 3.4 rating out of 5 stars based on 91 customer reviews isn’t a mean achievement. Next up on our journey through these amazing gadgets is the munchkin High-speed Bottle warmer. As the name suggests, this gadget was built with speed and efficiency in mind. This is probably one of the factors that make this gadget one of the most popular among consumers. Let’s take a critical look and see what it brings on the table. The bottle warmer takes a simple and compact build that doesn’t sacrifice design elegance. It comes in a white colored sleek body with a dimensional combination of 5.5x6x6.5 inches in terms of length width and height plus an accompanying weight of 1.4 pounds. These figures puts it in among some of the most portable bottle warmers on the market today. It tends to overheat and requires a lot of attention to the volume of water used. It is generally associated with safety concerns related to overheated bottles and milk. All in all, this bottle warmer presents an affordable option that offers speed and efficiency. However, there seems to be a crucial shortfall which is the propensity to overheat thereby posing a potential health risk. Though this is the case, it seems most users are having a good time with it as evidenced on Amazon where 680 customer reviews produced a rating of 3.4 stars out of five. 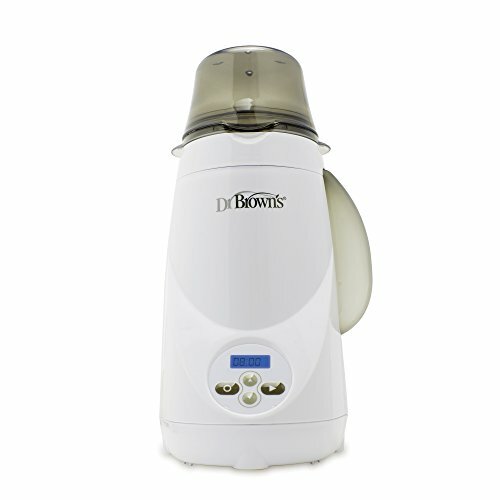 Another popular, best bottle warmers on the list is the Dr Browns Bottle warmer. It has the reputation of being one of the fastest and safest steam bottle warmers on the market. An array of great features also adorn this gadget. Let’s take a closer look. In terms of overall design, it doesn’t come any short of elegance. Out of the box, you will be met with a white bodied bottle warmer divided into a lower and broader body that is white in color. At the base you will see an LDC control panel that allows you to set the necessary parameters in a convenient way. In terms of size, it’s highly unlikely that you will have space issues as it comes in a combination of 5.3×7.8×9.4 inches in length, width and height. The accompanying weight shows a 2.09 pound value. Let us now consider the key functional features. All in all, it seems this is a feature packed bottle warmer that has a lot to offer. It basically has almost all the features top bottle warmers have except for a few blips as outlined in the disadvantages. When it comes to the customer reviews, Amazon records an average rating of 2.9 out of 5 stars based on 23 customer reviews. The rating isn’t as impressive as the performance it promises but it still remains a force to be reckoned with in the baby feeding industry. This is another bottle warmer that has achieved rock star status as a result of its attractive price tag and simplistic approach to enhance user’s experience. Let’s explore its feature set and weigh its advantages and disadvantages. The overall design presents a very neat look that will challenge your cleaning and hygiene skills, which of course is good for the little one. It comes with a solidly built chamber to house the bottle and a vial which you use to measure the water based on the recommended amount as directed by the manual. The compact design comes with a dimensional combination of 8x5x5 inches and a weight of 11.2 ounces. It requires refills in between warming cycles. Great features along with a generally positive review reflecting a good user experience makes this a worthwhile option to consider. According to amazon, it busks in an overall good rating of 3.4 out of 5 stars based on 91 customer reviews. If you are in for something that you would easily carry around while offering great features and at least a good performance, it is not a bad idea to include this product on your option list. This is one of the most portable devices on the market today and it has a lot more than just the size to offer. Let’s explore the device and see if this is the case. Once you get it out of the box, you will realize that the designers had flexibility in mind. It was designed to be used anywhere without the barrier of weight and size. The product dimensions tell the whole story with a length, width and height combination of 3.9 x 2.2 x 5.3 inches and a weight of 4.8 ounces. The Gland baby bottle presents a good option that provides portability and efficiency whilst bearing a modest price tag. According to customer reviews on Amazon, it seems to have a rather average response showing an average rating of 2.9 out of 5 stars. All in all, it is a gadget that provides good value for the money. If you are looking for something that offers a bit more than just bottle warming, this is one good gadget you may want to consider. This gadget offers three things as the name suggests. 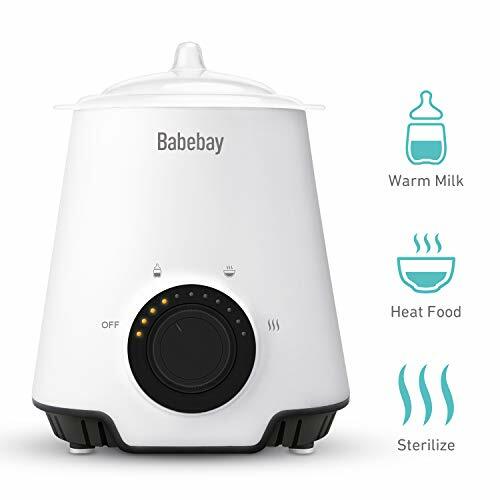 It can be used to warm baby bottles, sterilize and heating baby food. Getting it may mean killing three birds at a single throw. Let’s look at the associated specifics. The gadget comes in product dimensions of 7.87 X5.90 X 3.15 inches and an item weight of 1.77 pounds. The sleek and portable design goes along with a solid all-white build. A key design feature is the double bottle design which gives it the ability to handle 2 bottles at once. Lacks the auto shut off feature. 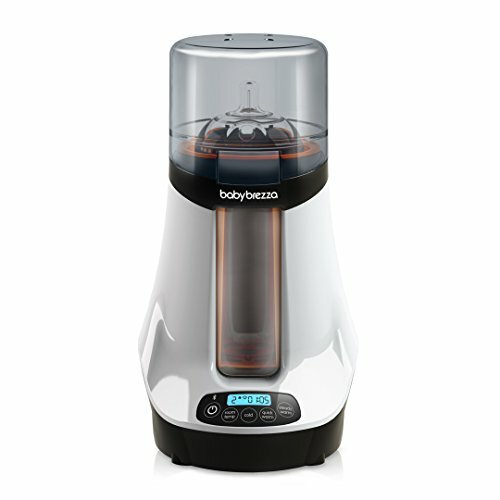 The bottle warmer and steam sterilizer offers a great option for those who are looking to get something that offers more functionality. The crowning feature is without doubt the three functional feature. If we get a bit stricter and concentrate on the bottle warmer, we find out there are some key features that it lacks when compared with most top notch bottle warmers. 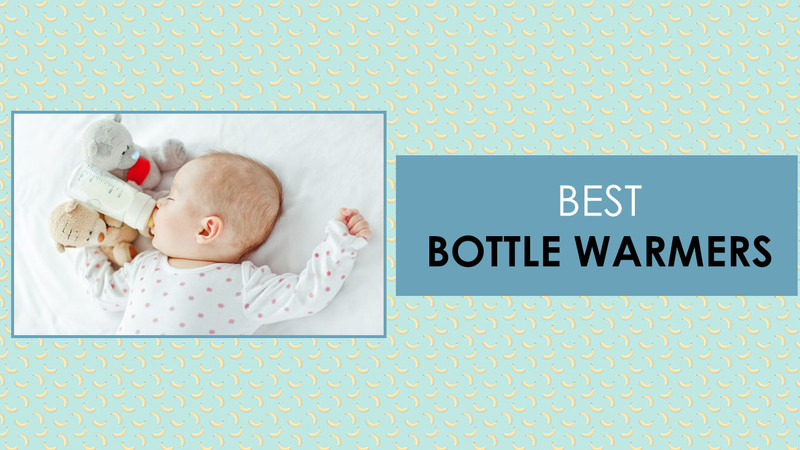 To put the matter to rest, bottle warmers are without doubt a great addition to any baby’s inventory and when the right choice is made, you are bound for a valuable experience taking care of the little one. The key in choosing the best for your needs is in understanding the advantages offered by these brands and then relating the knowledge to the ‘muscle in your pocket’. We hope this comprehensive review will empower you to a wonderful journey with the precious little one.